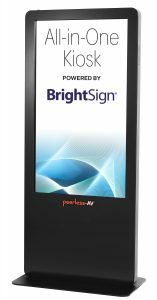 Peerless-AV has introduced its new All-in-One Kiosk, powered by BrightSign. It features an elegant, sleek design with lean frames and a small footprint, and offers a complete digital signage solution for any indoor application setting – from corporate to retail to hospitality, and beyond. It’s powered by a BrightSign Built-In Digital Signage Module, which means that the All-in-One Kiosk can deliver flawless Full HD 1080p60 single video decoding, HTML support, networked content playback, as well as an abundant set of features, including interactivity via the GPIO port, remote snapshot, live text, media feeds, and multi-zone. For more product details you can click here. This entry was posted on Friday, August 25th, 2017 at 06:47 @324 and is filed under DailyDOOH Update. You can follow any responses to this entry through the RSS 2.0 feed. You can leave a response, or trackback from your own site.